Ever wonder how the longest relationship in the Forever Woman Series happened? Read about Vivian Johnson and Pat Davis in the 6th volume of the series. The Bookstore, fifteen years of love and counting tells the tale of somewhat wild and raunchy playgirl Vivian Johnson, who is also Leah Williams’ (Forever Woman and Sweet Sarah’s Bluez) editor and good friend. Fifteen years ago, while working on one of her client’s book tours, she meets an interesting younger woman. Patricia Davis has just opened a women’s bookstore on a shoestring budget. Vivian is impressed that such a young woman from Generation X would bet her entire future on opening a woman’s bookstore and community center in the heart of a low-income neighborhood. They bump heads at first. Vivian’s client, Melba Farris (Mr. Jefferson’s Piano and Other Central Harlem Stories), asks her to set up a book signing in the bookstore, but Pat’s womanizing partner, Etta, wants more than a book signing from Vivian. The two partners argue about Vivian, causing Pat to say things to Vivian that she has to apologize for later. The book signing is exceptionally successful, but the two women decide not to see each other again. As fate would have it, a tragic fire and a murderous cover up throw the two women together again. While Vivian helps Pat get through Etta’s funeral and mourning period, the two women begin to see each other in a different light. 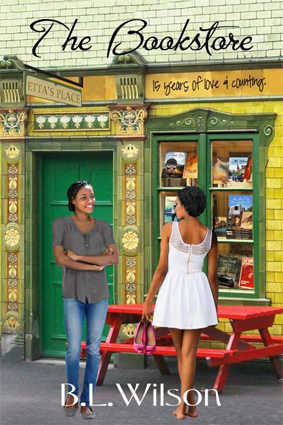 Can these two women from different generations and backgrounds get on the same page in The Bookstore? The Bookstore, 15 years of love and counting is available for pre-order 11/16/17 on Kindle. The release date is 12/2/17. COMING ATTRACTION! Look for volume 7 of the Forever Women Series: Forever Women in Love & Lust, hunks of hot burning passions. Forever Women in Love & Lust follows stud muffin and chic magnet Shannon Chestnut (from Ferrelli’s Restaurant) on her journey to find that special somebody. Along the way, Shannon meets Adele Hailey (The Bookstore and Ferrelli’s Restaurant) who ignores her flirty and bold ways to partner with Percy Burnette (Forever Woman) tailor extraordinaire. When Adele says no, Shannon finds comfort with Gloria Lopez (Sweet Sarah’s Bluez) and several other women ready, willing and able to play games. Will Shannon ever stop playing games long enough to find that special someone?